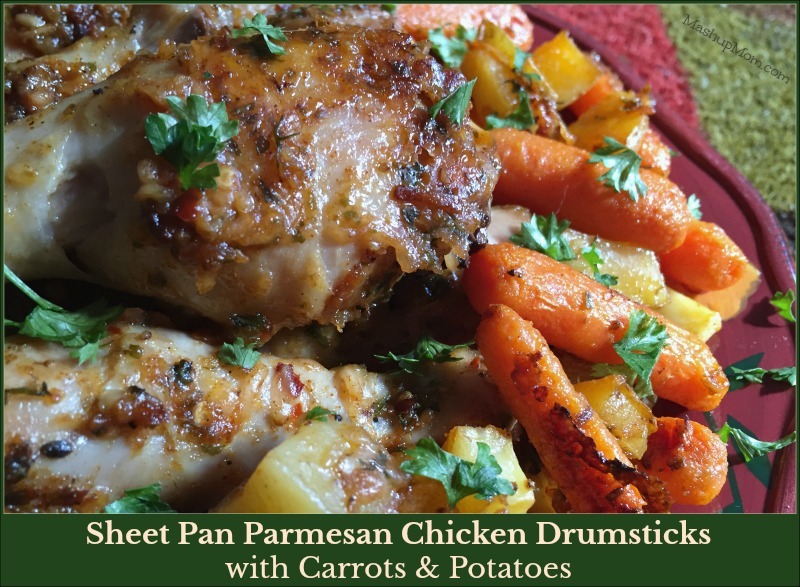 How about another easy sheet pan dinner recipe today: Sheet Pan Parmesan Chicken Drumsticks with Carrots & Potatoes! Why carrots and potatoes, in particular? Because: 1) I had them in the house, and 2) Both go (almost) as wonderfully with the salty goodness of Parmesan as does chicken. 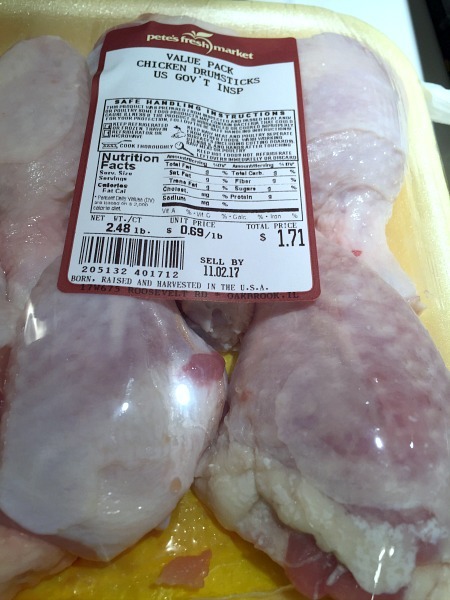 Why chicken drumsticks, in particular? Well, last night we splurged on sushi, so today I wanted to reign it in with a more frugal all-in-one dinner. Sometimes we save so that we can have the occasional guilt-free splurge, right? Looking at what I had on hand, I found this cheap pack of chicken drumsticks from my local produce store (although drumsticks are generally affordable even when not on sale), the end of a $.99 bag of potatoes (also on sale at my local produce store), half a bag of better-use-them-soon baby carrots from a previous $.49 sale at ALDI — and of course I always have shredded Parmesan in the fridge. You know. In case of emergency. Since I picked up all of these ingredients on sale at one time or another and used a cheap cut of chicken, tonight’s sheet pan Parmesan chicken drumsticks dinner stands in stark contrast to last night’s sushi splurge — clocking in at under $5.00 for the whole meal. Line a rimmed baking sheet with foil and spray it with cooking spray, then preheat oven to 400 degrees. Melt butter in a large bowl and stir in olive oil, Parmesan, and spices. 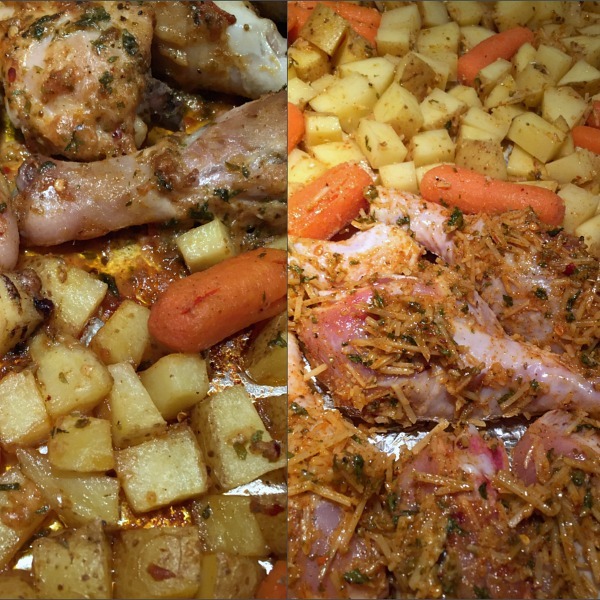 Place carrots and potatoes on one half of your prepared baking pan. Dollop 3 Tbsp of the butter-Parmesan mixture onto the carrots and potatoes, toss to coat, and arrange them in a single layer on one end of the baking sheet. Roast at 400 degrees for 45 minutes or until chicken is cooked to temperature and potatoes are soft, flipping drumsticks over with tongs and stirring vegetables halfway through. 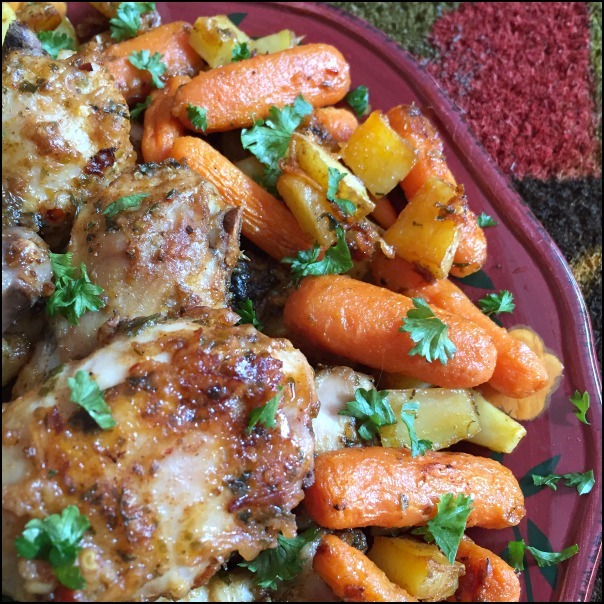 Serve your Parmesan chicken, potatoes, and carrots topped with chopped fresh parsley for contrast if desired, scraping up the browned bits of Parmesan from the pan to add to your veggies. Note — Next time I might cut back on the butter by just a bit. Whether you do or not, though, don’t skip lining the pan with foil: No one wants to scrub off burned-on Parmesan. My finished drumsticks here look somewhat less shake-and-bakey than those in the recipe that originally inspired me, mostly since I used shredded rather than grated Parmesan. Different doesn’t mean bad, though: Especially when combined with the carrots and potatoes, however, they’re still quite lovely in a fall colors sort of way! And speaking of different doesn’t necessarily mean bad: Tonight’s sheet pan Parmesan chicken drumsticks dinner is no sushi, but it’s still quite tasty and satisfying on a chilly autumn evening. A naturally gluten free one pan meal, these sheet pan Parmesan chicken drumsticks are juicy, full of flavor, and just cheesy enough! Serve with fruit or a simple green salad on the side to balance out all of the warm Parmesan flavor. 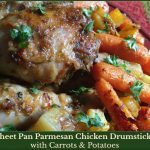 Sheet pan Parmesan chicken drumsticks with carrots & potatoes is a flavorful and naturally gluten free one pan meal. Roast at 400 degrees for 45 minutes or until chicken is cooked to temperature and potatoes are soft, flipping drumsticks over with tongs and stirring vegetables halfway through. 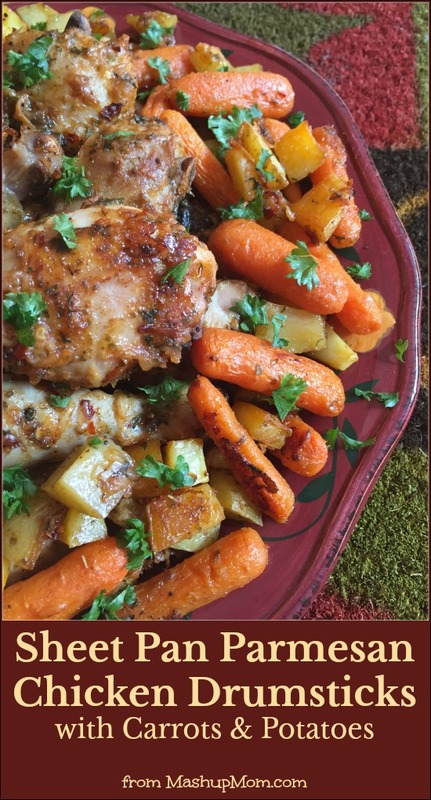 Serve your Parmesan chicken, potatoes, and carrots topped with chopped fresh parsley for contrast if desired, scraping up the browned bits of Parmesan from the pan to add to your veggies. Next time I might cut back on the butter by just a bit. Whether you do or not, though, don't skip lining the pan with foil: No one wants to scrub off burned-on Parmesan. Rachel – could you use chicken breasts with this instead? My hubby does not like to pick through bones to get to the meat. The kids love the chicken legs though. Of course. You might need to adjust the cooking time, though, and breasts do tend to dry out a little more when you oven bake. Use bone-in and start check the internal temp just to be sure at about 35 minutes in, depending on thickness — white meat cooks through faster, but since breasts are thicker it may even out. I’m so excited to try this! The other week my Aldi has marked down value packs of split chicken breasts and chicken thighs. I picked up one package for $1.56 and the other for $1.41!!! Mine were a bit too salty (my error), but this is a great recipe! I didn’t do the potatoes and carrots. I made a mushroom risotto instead with roasted asparagus. Everything from Aldi except the arborio rice that I already had. Love your recipes!